EAGLE ONE TO WANTA Preview from Gibby Media Group on Vimeo. Eagle One to Wanta Gibby Media Group , Inc is producing a feature documentary film entitled “Eagle One to Wanta”. It is the compelling story about President Reagan, and how he brought about the fall of the Soviet Union and ended the Cold War without firing a shot. President Reagan and his secret agent, Ambassador Lee Emil Wanta, masterminded a creative way to financially take down the economy of the Soviet Union( Evil Empire) and put together and negotiated an agreement with Secretary General Mikhail Gorbachev. As a result the Russian Federation was born and future generations throughout the entire world have enjoyed more safety from a nuclear holocaust because of this effort. Working directly under President Reagan as a private citizen, there is a man named Ambassador Lee Wanta. Lee was mandated by President Reagan under the Totten Doctrine [92 U.S. 105, 107 (1875), National Security Decision – Directive Number 166, dated March 27, 1985, inter alia] as a secret agent to be in charge of this effort. In this process Lee Wanta did amass trillions of dollars that were designated to go back to the American people by President Reagan. In his effort to carry out his mandate, Lee Wanta was imprisoned and the monetary funds that were his to distribute as planned were stolen or converted illegally by an organization known as the Federal Reserve System and used by them to this day. Later in 2006 a US District Court Judge mandated and ordered that these converted funds be returned back to Lee with interest accruals. It’s hard to understand why, after eight years since this order was given by a US Judge, that these funds are still retained. When Lee Wanta receives his funds back it will be in the amount of 32.8 trillion dollars. He promised under an oath to President Reagan that after he pays his repatriation taxes on this money he earned as director general in his Austrian based company, Lee has pledged to eliminate overnight our national debt (approximately 18 trillion), and our 1.8 trillion International trade deficit at once. He also will pay certain sovereign nations what they were promised in the Reagan-Mitterrand protocols. This includes the French, Chinese, English and Russian Governments, where billions were promised. With the remaining funds left over he plans to develop and create a high speed rail system for our country and develop new innovative businesses that could employ over 2 million people in the USA alone. 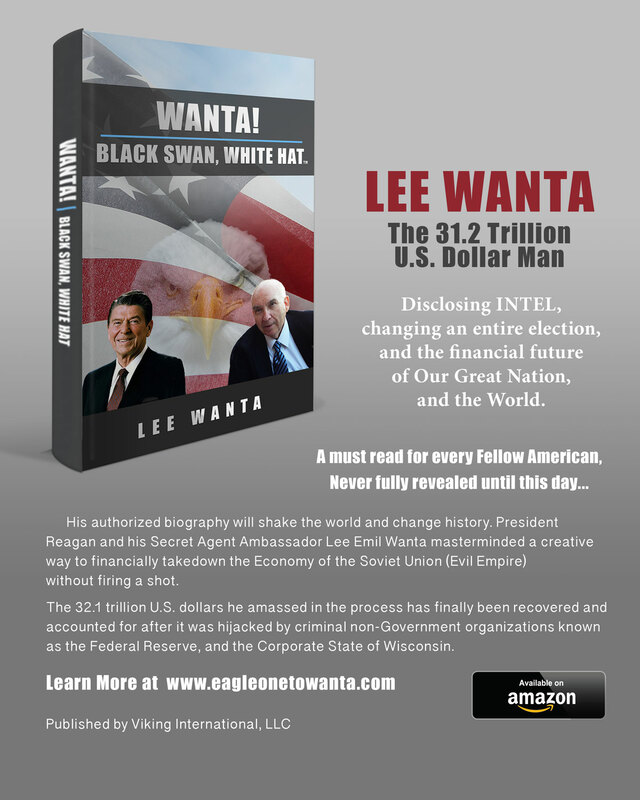 Ambassador Lee E. Wanta Biography is now available in PaperBack!